Approximately 35 people are dead and more than 100 injured following an explosion in Moscow’s Domodedovo Airport on Monday afternoon. State authorities are calling the attack an act of terrorism and three suspects are currently being sought. According to preliminary information, the explosion occurred at 4:32 pm local time after a man carrying a bag entered Domodedovo’s international arrivals area, where a large crowd was waiting at the baggage claim. The bomb that then exploded was at least as powerful as 5 kilograms of dynamite and was filled with metal screws and bolts to heighten its impact. Other witnesses said the baggage claim was filled with smoke and the smell of ash. A series of videos on YouTube and Twitter filmed during the immediate aftermath of the explosion showed thick smoke and piles of charred bodies, as well as medical personnel wheeling victims out of the airport. According to RIA Novosti, airport workers dismantled part of a wall to widen the exit for the victims. Early reports of the number of victims varied. According to the Ministry for Emergency Situations, 168 people were injured, 74 of whom have been hospitalized. Moscow regional governor Boris Gromov told journalists that 34 people had died, two of them in the hospital. 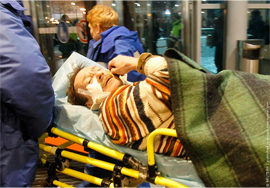 Meanwhile, Domodedovo’s press service reports 35 dead and 46 injured. Sofia Malyavina of the Ministry of Health and Social Development reported 35 dead and 130 injured. A statement on Domodedovo’s website confirmed that the explosion had occurred in the international arrivals area, “where people who aren’t passengers have free access.” It also said that the airport was operating normally, and that aircraft were still being allowed to land and take off as usual. State authorities are calling the attack an act of terrorism. Operatives from the Federal Investigative Committee have been dispatched to the airport. Authorities have reportedly found the head of a man who appears to have been the bomber. “The head of a man of Arab appearance has been found; he was approximately 30-35 years of age; he presumably set off the explosive device,” a source told Interfax. The three men who have been identified as suspects were apparently already wanted by Russia’s federal security services before Monday’s attack. According to RIA Novosti, a recent operation had been carried out to detain the suspects in Moscow’s Zelenograd district, but was unsuccessful. “Until relevant expert analysis has been carried out, you need to be very careful when dealing with different types of terminology, including the word ‘suicide bomber,'” said one official, explaining that the bomb could have been detonated remotely, unbeknownst to the man carrying it. In response to the attack, Russian President Dmitri Medvedev postponed a trip to Switzerland, where he planned to arrive on Tuesday to participate in the World Economic Forum. According to Gazeta.ru, the president ordered Moscow Mayor Sergei Sobyanin and Governor Gromov to go to Domodedovo personally to ascertain the situation. “Everything needs to be done… to obtain quick information and conduct an investigation without delay,” Medvedev said at a press conference. Chief of the Ministry of Health and Social Development Tatyana Golikova was sent to the airport by Prime Minister Vladimir Putin in order to determine what kind of aid would be necessary for the victims. “A project for a government ordinance on providing material aid to the families of the victims needs to be prepared,” the prime minister said in a meeting with Golikova. Moscow city officials said that the families of victims would be compensated with funds from the city budget. “Aside from federal payouts, families of the victims will be compensated with 2 million rubles, critically-injured victims by 1.5 million rubles, those with moderate or mild injuries – 1 million rubles,” said Mayor Sobyanin. In addition, funerals for deceased victims would be free. “All of these services should be free,” said the mayor.